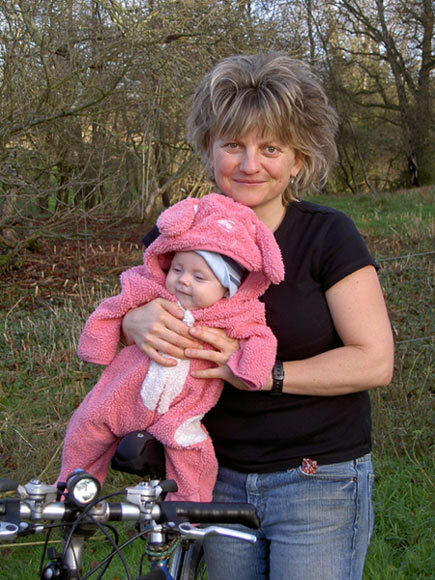 Just when you were beginning to think I must have disappeared into the ether of babyhood, I resurface from a surplus of sleeplessness and aromatic nappies to give you an update on bikes, books, babies and birthing procedures. Well, maybe not birthing procedures except to say that to those with a budding cyclist to release into the world, I recommend cycling while pregnant (that is if your body?s already used to a daily pounding of pedals) before cycling up a 1:4 hill on your due date. Seems to get things moving along nicely and at quite a pace too. Once Molly was born, cycling took a backseat for a week or so as the thought of sitting on a saddle was not the most appealing one. Luckily, all bottom bracket areas soon recovered and at every opportunity ? ie.whenever Gary (the builder) or Gran (mum) take Molly for a walk, I don a sturdy pair of reinforced shorts, mount my steed and go charging up as many hills as I can in the allotted time. In between feeding, cleaning, changing, cuddling, walking, bathing and playing with Gary, I mean Molly, I have been writing book on cycling around New Zealand. After far too many through-the-night writing sprees, I?ve finally got there. Finished product out March 1st.